The team of explorers ambushed in Uganda have returned to the Nile to continue their ascent by boat. Before they left, expedition leader Neil McGrigor spoke to PBO about the risks, the challenges and the horrific attack by rebels, which killed British man Steve Willis. Neil searched for Cam, Garth and George, not knowing if they were alive or dead. George emerged from the bush shortly after with Garth, who had a head injury where a bullet had grazed his skull. The Ugandan army came to their aid, and searched for Cam, who was found five hours later having run 25km through the jungle without shoes. Neil’s twin boys are too young to understand their father’s absence and the risks he’s taking, but his wife is right behind him, and told him not to let her be a barrier to what he wants to do. Some days the team called on villagers to help them drag the RIB through bush and rocky outcrops, and on the water they had to negotiate fearsome rapids, curious hippos and charges from crocodiles. They used satellite imagery to pick their way through swamps, often having to back-track, but found the best pilotage tip of all was to look for the track of the water hyacinths, which flowed downriver. The three-man team: Neil McGrigor, Cam McLeay and Garth MacIntyre left Rashid, Egypt, in September 2005, with extra team members George Heathcote and Juma Tiri joining them in Uganda. After the ambush in Murchison Falls National Park they flew home, and on 3 March this year returned to Uganda without George, starting further upriver at Karuma Falls. The men are travelling in three Zap Cats – small, inflatable twin-hulled boats – and are buying fuel and supplies en route. 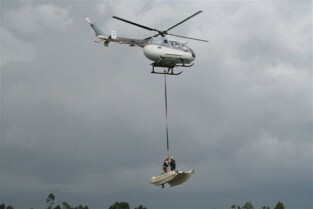 Previously they were using a flying inflatable RIB (FIB) to lift them over the toughest rapids, but as they crashed this, they’ve since been airlifted over the falls by helicopter.